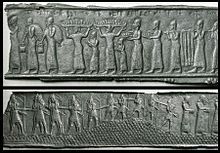 Other surviving types of art include many cylinder seals, a few rock reliefs, reliefs and statues from temples, bronze relief strips used on large doors, and small quantities of metalwork. A group of sixteen bronze weights shaped as lions with bilingual inscriptions in both cuneiform and Phoenician characters, were discovered at Nimrud. 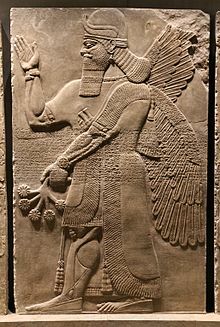 The Nimrud ivories, an important group of small plaques which decorated furniture, were found in a palace storeroom near reliefs, but they came from around the Mediterranean, with relatively few made locally in an Assyrian style.